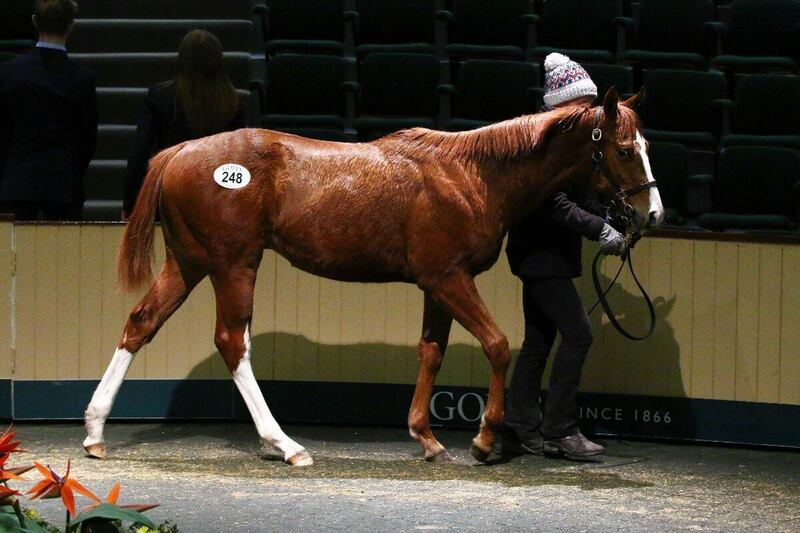 A trio of six figure purchases were the highlight of Day 1 of the Goffs February Sale, a session dedicated to weanlings. Trickledown Stud provided the sales topper with their son of Showcasing, the first foal out of the Listed winner and Group placed mare Porthilly (Lot 248 – pictured), that sold to Stauffenberg Bloodstock for €120,000. Tara Stud provided another of the stand outs of the day’s trade as their Lope De Vega filly (Lot 206) was knocked down to Cathy Grassick of Brian Grassick Bloodstock at €100,000. Out of a Stakes performer, the filly is a half-sister to the winner and Group placed Dream Mover as well as Listed winner Taper Tantrum. The first to reach the €100,000 mark was Ballintry Stud’s Sea The Stars colt out of the Champion Italian 2yo Fly On The Night (Lot 104A) who was bought by Avaz Ismoilov, one of his seven purchases today. The February Sale continues tomorrow at 10am with a quality selection of two year olds, older horses and breeding stock set to go under the hammer.